China Galvanized Grating Ceiling, Painted Grating Ceiling, Steel Grille Ceiling Manufacturer and Supplier. 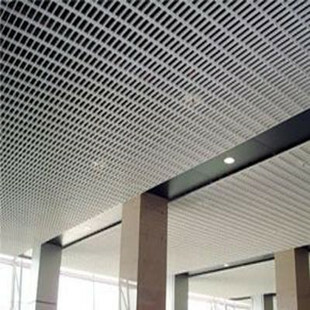 Product categories of Grating Ceiling, we are specialized manufacturers from China, Galvanized Grating Ceiling, Painted Grating Ceiling suppliers/factory, wholesale high-quality products of Steel Grille Ceiling R & D and manufacturing, we have the perfect after-sales service and technical support. Look forward to your cooperation! The ceiling is designed and produced based on gratings, with advantages of light-weighted, beautiful looking, easy installation and strong enough for walking. By hot-galvanizing surface treatment, the ceiling has good property on anti-corrosion and enjoys long life span, no need for painting on surface maintenance. It is widely used in the buildings of cigarette and other industries, large scale stadiums, exhibition centers, commerce facilities, stations, docks, airports, etc.